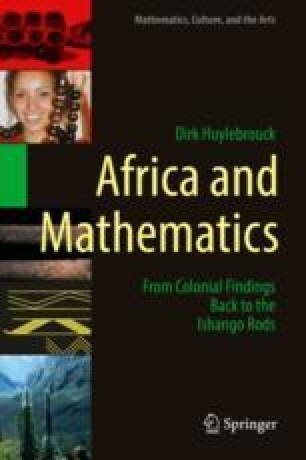 This chapter goes into more detail about the mathematical aspects of the artefact found first. It carries three columns of grouped carvings: 3, 6 ; 4, 8 ; 10, 5 ; 5, 7 and that could indicate a doubling operation. Two other columns show the groupings 11, 21, 19, 9 and 11, 13, 17, 19, or and they correspond to 10+1, 20+1, 20-1, 10-1 and the four prime numbers between 10 and 20, again pointing to some arithmetical operations. Since the sum of the tallies on the last two columns is 60, and that of those on the first 48, one could think of an astronomical calendar. The interpretations of the Ishango rod, as an arithmetical game or as a calendar, are compared, and a new hypothesis is proposed, defended by V. Pletser and the author. It is less spectacular than the arithmetical game with the prime numbers or the astronomical calendar, as it affirms that the first Ishango artefact is a simple tally stick, used by a people counting in base 6 or 12, grouping the tally lines according to its number words, just as today groups are often made referring to the base 10.